Editor’s note: Archbishop Nienstedt’s column was written and submitted prior to the allegation announced Dec. 17. On Oct. 1, our archdiocese received a great gift from Pope Francis, Time Magazine’s Man of the Year, when he nominated Father Andrew Cozzens as an auxiliary bishop to assist me in my ministry. I had the great joy of ordaining him in our glorious Cathedral on Dec. 9, the feast of the Immaculate Conception, a title under which our country is dedicated to the Mother of God. Being that Bishop Cozzens is the second youngest bishop in the country (just one year older than Bishop Cepeda of Detroit), he is also a great sign of hope for the future of our Church. The cause of our joy is, of course, the three comings of our Lord in time, namely, his birth at Bethlehem, his triumphant return at the end of the world, and finally, his presence in the Blessed Sacrament. In many ways, our joy is a direct result of our hopes and expectations to meet the Lord whenever he comes. The second reading last Sunday reflected the early Christians’ desire for the Lord’s second coming. They really couldn’t wait to see it happen. But St. James counsels them to be like farmers awaiting a harvest. They must be patient to see the plant mature, always hopeful that it will indeed bear fruit. The first reading finds the Jewish nation exiled in Babylon under the oppressive regime of King Hezekiah. But Isaiah’s disappointment with the present situation does not lead him to despair. Rather, it sparks in him the hope that God himself will come to his people’s rescue. In the Gospel of St. Matthew, John the Baptist has been placed in prison by Herod. As he sits in confinement, he begins to doubt if his cousin, Jesus, really is the Messiah he had come to expect. Jesus refers John’s disciples to the above passage from Isaiah telling them, “Look, the blind see, the deaf hear and the dead are raised to new life.” In other words, the prophets’ words are being fulfilled. What a hopeful message that must have been for St. John the Baptist sitting alone in his prison cell. Then, the pope makes reference to St. Josephine Bakhita, who was canonized by his predecessor, Blessed John Paul II, on Oct. 1, 2000. (Her feast day is celebrated on Feb. 8). Born in the Sudan, she was kidnapped at the age of 9 and sold five times in the Sudanese slave market. She was emotionally and psychologically abused, flogged every day until she bled. As a result, she carried 144 scars on her body throughout her life. Eventually, she was bought by an Italian merchant who brought her to Venice, Italy. Through this Italian owner, she came to know a totally different kind of master, the one she called “paron,” the living God of Jesus Christ. This new master was good and kind and loving. Through an encounter with him, she learned that she was loved and that she was a free child of God. For the first time in her life, she became a woman of hope. Eventually, she joined the Congregation of the Canossian Sisters and spent the rest of her life handing on to others the hope that was born by her conversion, a hope she felt compelled to extend to others. I suggest to the faithful of the archdiocese that St. Josephine can be for us a patroness and an intercessor in light of the trials that we have been going through these past 10 weeks here in the Twin Cities. On Gaudete Sunday, I shared these reflections with about 2,000 parishioners during my homily at two Masses at Our Lady of Grace in Edina. Many people probably do not know that I spend most every weekend presiding at two or more Masses at parishes around the archdiocese. In fact, since my own installation seven years ago, I have had over 180 such parish visits with weekend Masses. So, during my visit to Our Lady of Grace, as I did during the Masses I participated in over the weekends through November and the first part of December, I shared with parishioners how sorry I was that our Catholic people have had to endure so much these past months. 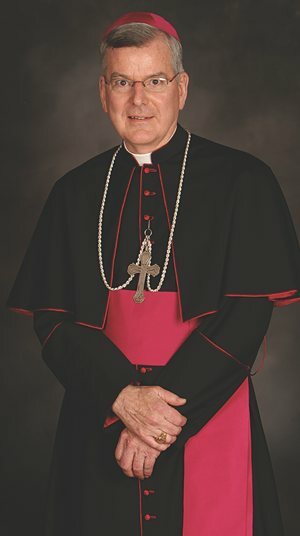 I said that the news reports about past incidents of clerical sexual abuse in this local Church have rightly been met with shame, embarrassment and outrage because such heinous acts were perpetrated by men who had taken priestly vows and because some of these men had not been removed from ministry. I apologized to them — and I apologize again here to the nearly 100,000 readers of The Catholic Spirit — for the indignation that you justifiably feel. Catholics in this archdiocese deserve better, and I am committed as archbishop to keep my promises through the many actions my leadership team and I have been taking these past few months to fix this problem with honesty and transparency. Those actions include the disclosure we made in the last edition of The Catholic Spirit, something I committed to do well before meeting with the court in early December. Those actions also include the work of an independent task force, whose efforts continue without my interference, and a thorough review of our clergy files by an outside firm. These are concrete and unprecedented actions, and they fulfill the promise of my words. If one reviews carefully the list of 34 priests that I disclosed a week ago in The Catholic Spirit, the majority of those allegations go back to the 1970s and the 1980s. Again, that is not to excuse those actions or diminish the serious harm done to their victims. But it does indicate that progress is being made in reducing the incidence of such terrible misconduct. There is reason, even now, to be hopeful. 4) To reassure our clergy of our deep and abiding gratitude for their tireless and self-giving service, and to assure them of our commitment to them and to their legal and canonical rights. Strengthened by the prayer of the faithful of this local Church and with God’s grace, I believe that we will emerge from this difficult period to become a stronger, more focused, more prayerful and more purified local Church. But the key to that process lies in our ability to remain a people of hope — hope not in our own resources, but rather hope in the person of Jesus Christ, who can make all things new. The holy Eucharist that we receive at Mass is not just informative, assuring us that we are loved by the Lord in a personal and intimate way. This Holy Eucharist is also performative, meaning that it can make us a people of action who can address past wrongs and find ways to do better in the future. Even in the face of such daunting events, let us never forget that we are an Advent people, a people of hope. Let us pray that the Lord will fill us with an abundance of that great virtue, so that we can, like St. Josephine Bakhita, transform the present situation before us into something salvific, saved by our hope in the Lord Jesus. In that spirit of joy and hope, then, I extend to the priests, deacons, men and women in consecrated life and the lay faithful of this local Church my deepest thanks for their prayerful support as well as their fidelity in living out their baptismal commitment. It is your love for the Lord Jesus and his body, the Church, that inspires in me a great sense of joy and hope this Christmas. And I am truly grateful to you for that. May that same joy and hope fill your hearts abundantly throughout this Christmas season.